Je bekijkt alle berichten met de tag: "Music". 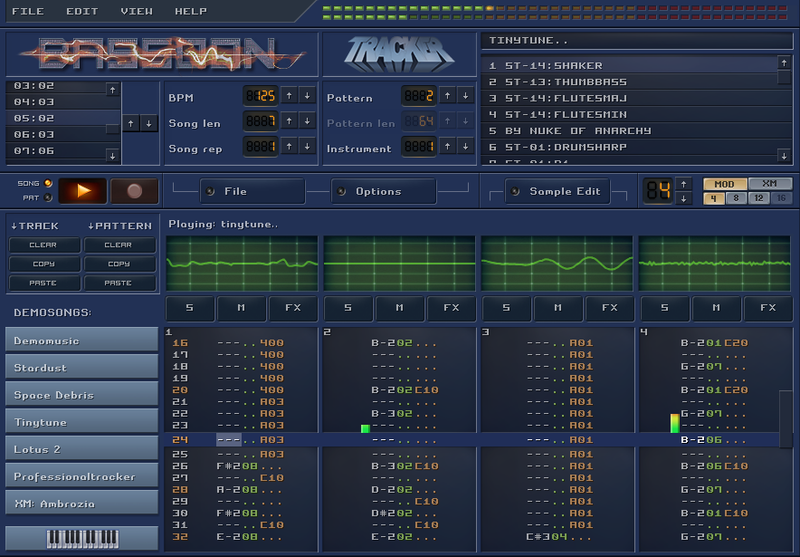 Tracker music originated way back in 1987 on the Amiga computer. This was an era where PC's only made bleep sounds. Even as the Atari could produce some funky chip sounds, then there was this all-singing-all-dancing Amiga machine that could produce 4 channel wave-audio. 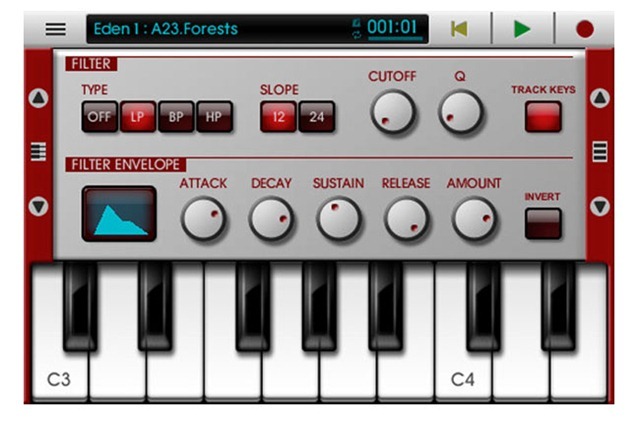 Ok, it was still 8-bit sound, but suddenly everybody could access a digital music creation tool for an affordable price where previously you would have to spend a fortune on hardware samplers and midi interfaces to get the same possibilities. My first sampler I soldered myself: You could plug it into the parallel port of the Amiga to "record" analog audio signals into 8-bit samples. 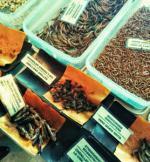 It produced very low quality samples, but ohh... the wonder of it all! Tracker programs where made by developers for developers: You don't enter notes on a musical bar, you enter notes as numbers in a grid with your computer keyboard and you apply effects by entering even more numbers. All in hexadecimal of course, as plain decimal number are for pussies. I especially like the format because you sort of get the sheet-music AND the instruments together with the song. If you hear a cool piece and go like "Wow, how did they do that?" you can jump right in and examine what samples are used and what effects are applied. It's like an open-source music format where you can do a "view source" to see exactly how it's done and fiddle with it, much as you can do with any website or web application. 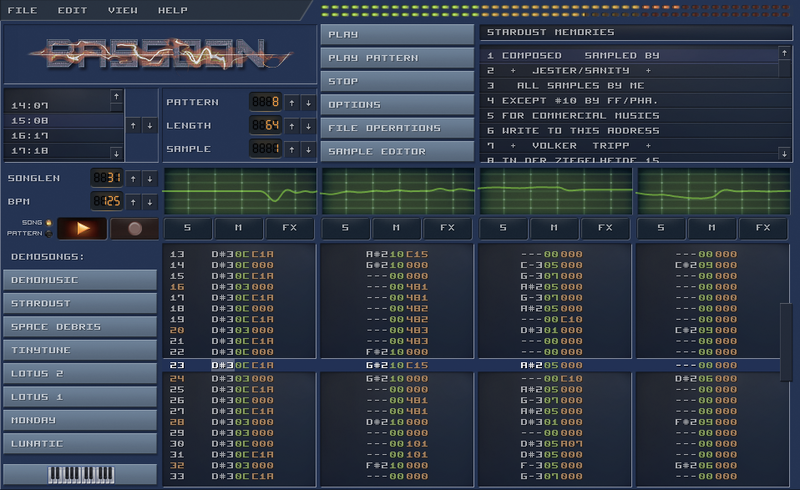 The golden age of the Amiga is long gone, but the tracker format lives on. There have been countless spin-offs and remakes. 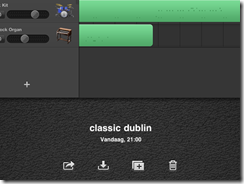 Even in modern audio software like Renoise, Radium and Sunvox the tracker spirit is present. And of course there's openMPT: It doesn't have a cool and snazzy interface but it's the most compatible and complete true tracker around. Remember: these are not just mp3 files you hear, the music is reproduced using samples that are played and manipulated in sequence in real-time. This is why mod files in general are quite small, making them perfect for (early) games and other projects where file size is important. I wanted to research Web-Audio, especially real time audio manipulation. I wanted a real tracker where you can open, edit and save mod files, not just a player. It should perform well on mobile browsers. Most mod players don't work that well on mobile browsers. 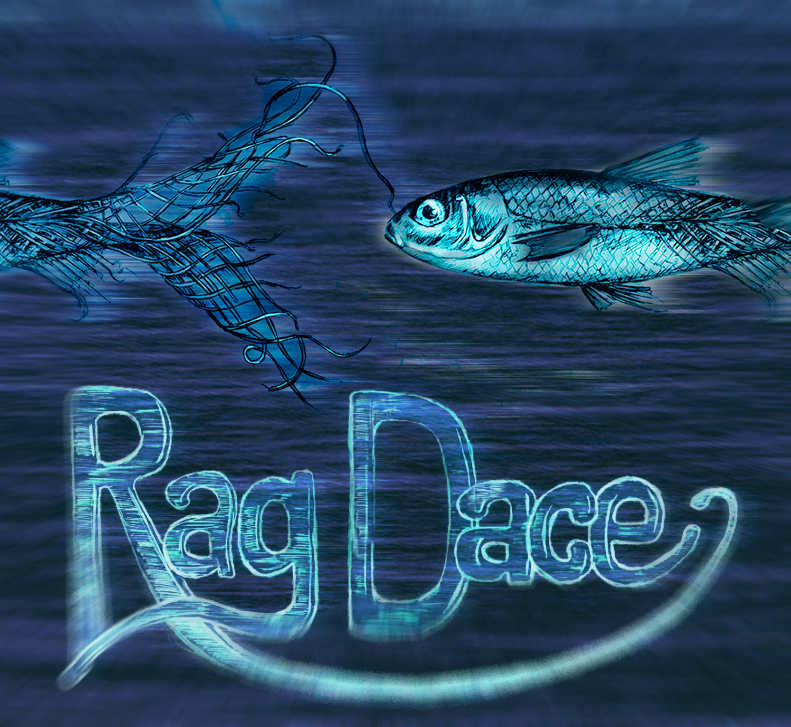 I took a high-level Web-Audio approach which makes it perform really well on mobile browsers. Even if the UI slows down, the music should never stutter. I wanted to build a SCALABLE cool retro user interface. Most old-school trackers have a fixed size user interface. I wanted a pixel-retro interface that scales with the screen. That's a pretty cool feature even if I say so myself! I wanted to have a decent music playback engine to be able to build upon: a drum-sequencer? a midi-player? real-time online collaboration? all rather straightforward once the main playback engine is in place. Anyway - here are some examples! Title track of the game "Lotus Turbo Challenge 2"
The ModArchive hosts thousands of tracker songs and they have an API so you can directly access them from within Bassoon Tracker. The source files are available on GitHub. Have fun, and if you think of any cool feature you're missing: let me know! Wave you hands in the air and pong it like you just don't care! 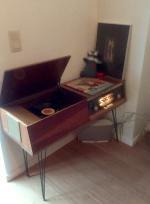 I like old stuff: it has a story, it is used. it has flaws. And exactly those imperfections are interesting. Waba-Sabi you know? and that's also why In my opinion most "pre-computer music" sounds better. When you take a basic step sequencer or midi program, it's a robot: all notes are aligned on a fixed grid and it usually takes some effort to get a "human feel" to your music. Now what if you could ease it up a bit in a fun way? 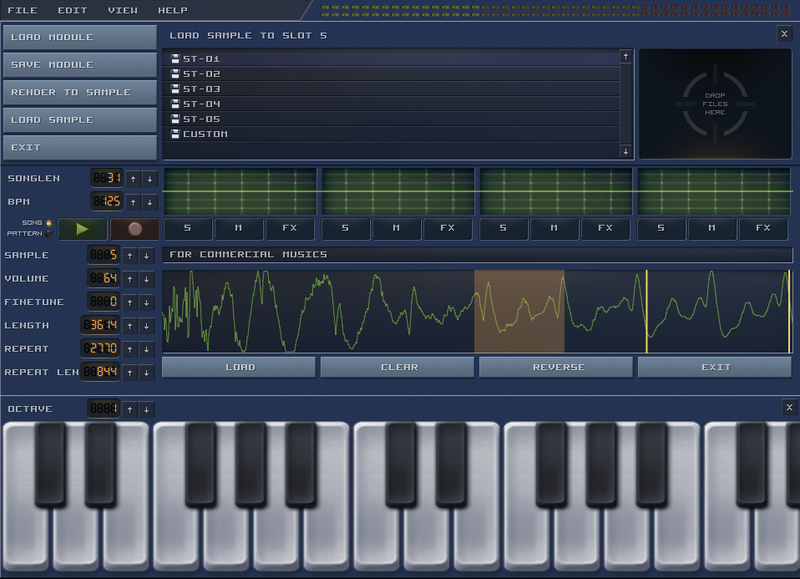 Let's take the graphical representation of a "beat" in most common step sequencers. and let's take this thought one step further: the graphical representation defines the music, right? So what if we alter the graphics, would the music change too? For example, if we want to add a fade, we can just as well use photoshop to add some blur, right? And if we want to loosen up that fixed grid, why not use a graphical filter to make it more "wobbly"
This way we can use graphical tools to mold your music into a more organic shape. 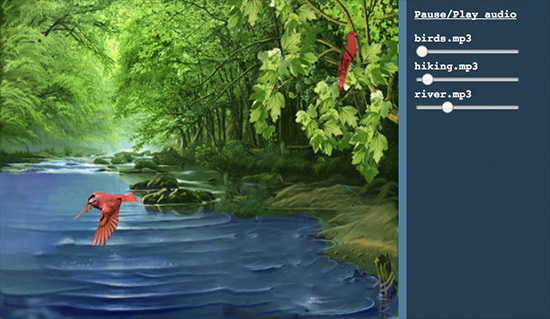 What if we could "read" any image in a musical way? 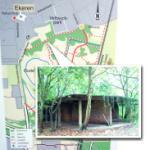 An image consists of lot's of coloured dots, each dot has some info we can use. 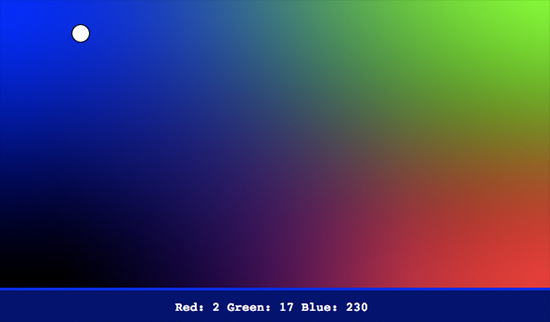 on a computer screen, this is for example the amount of red, green and blue and the transparency. We can sample that info from an image and use it for something musical. To pour that into something musical, we can use "the bouncing ball" effect: a ball bouncing around in a rectangular box has 2 rhythms that are both fixed but as the sides of the box are not equal, the rhythms are constantly shifting. It has the predicable structure of a beat box, but also the unpredictability of 2 patterns intermingling: Exactly the interesting effect we are looking for. Try it out for yourselves! Of course we don't have to use a static image, we can use a video or ... a camera! That is when things really get interesting: when you connect a camera as your graphical/musical input source, you can interact with your musical model live, in front of your camera. Add a little motion-tracking and color-tracking, and you get a pretty accurate way of triggering musical events using your webcam. To go all the way back to music software, we can even add some MIDI to trigger midi events using your webcam, and to record everything you do in your midi sequencer to take it further along towards a full musical production. Wham! Before you know it, you got yourself a playful musical instrument. Of course, it's a bit hard to control. It's probably wise to limit yourself with some quantization or some predefined chord schematics to get the sound you want. To be honest, I had to do a lot of post-processing on the midi data ... my motion tracking routines are somewhat crude and fly all over the place. If you want to try it out for yourself, come find me a Barcamp Antwerp 7 this saturday, where I will be doing a live demo and will release all the tools I used. Yes indeed: barcamp STILL is one of the most inspiring events EVER. The concept is simple: short and open talks about anything you're passionate about. The presentations won't be perfect, but they will be real and honest, which makes them far more valuable then about 90% of al other talks on "professional" events. Schoon, die "Leave a Light On" van Marble Sounds. 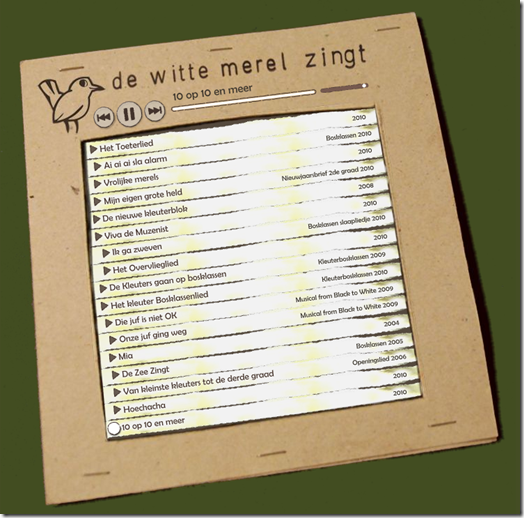 Voor diegene die - net zoals ciska - goesting hebben om hun mooiste zangstem boven te halen en er een warme kerstversie van te brengen maakte ik er een instrumentale meezing versie van. Ik zocht eigenlijk vooral een testprojectje om de nieuwe versie van Ableton Live eens uit te proberen. 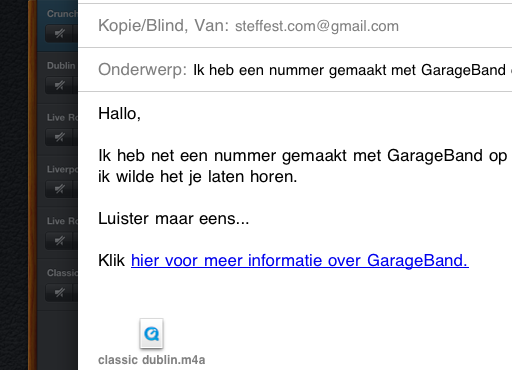 Hier is het midi bestand mocht je er zelf mee verder willen prutsen. Yay! finally took the time to finish a little Arduino project. It's a another bot, more specific: a web controlled drummerbot! 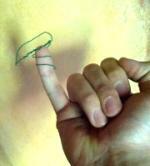 Yes yes, the same old trick: web interfaces to physical objects: Me LUVS them. Hey, I feel a song comming up! Tap the drum pattern on your phone and this little bot will rock it! 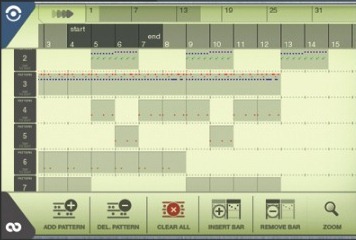 You control it like most drum computers: you draw the beats on a pattern of sixteen dots, perfectly suited for generic 4/4 rhythms. There a 8 lines, each controlling 1 servo motor. Most of the servo's have a percussion item both on the left and the right, that's why the pattern buttons have 3 states: off, left, right. 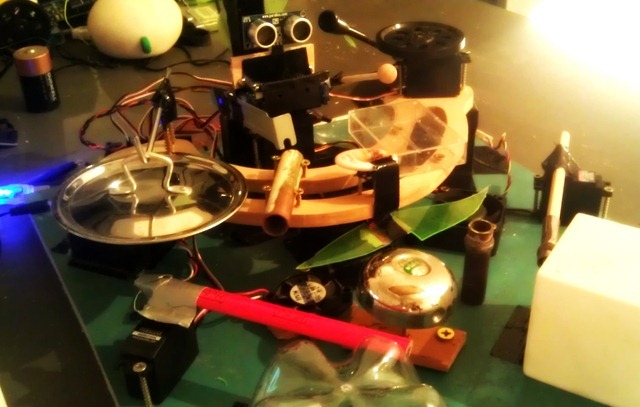 That makes 14 distinct percussion sounds for the drummerbot. 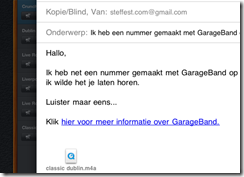 The pattern in the webbrowser is packed into a string, which get send to the Arduino via HTTP. You can use a wifi module and a http server on the Arduino, or you can use another device attached to the Arduino through a comm port. The Arduino receives the string, unpacks it back to a pattern and simple loops over the steps controlling each servo. You can also download the Arduino code here. I must admit: the drums sound a bit dry without amplification though. 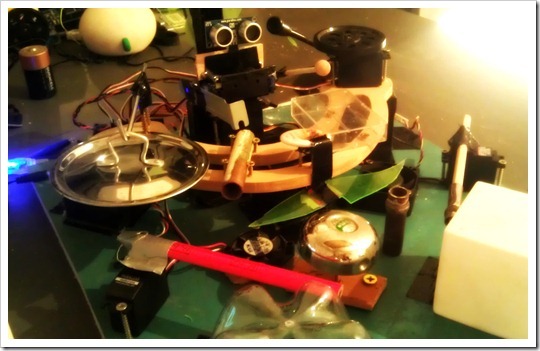 I'm specifically fond of the "Horns"
They are 2 little fans with a servo pushing a piece of plastic against the blades. A hell of a noise but when you add heaps of fuzz, chorus and overdrive effects they are pretty convincing. If you want to jam along yourself: hop over this saturday to Barcamp Antwerpen, where I'll be giving a presentation with/about the bot. 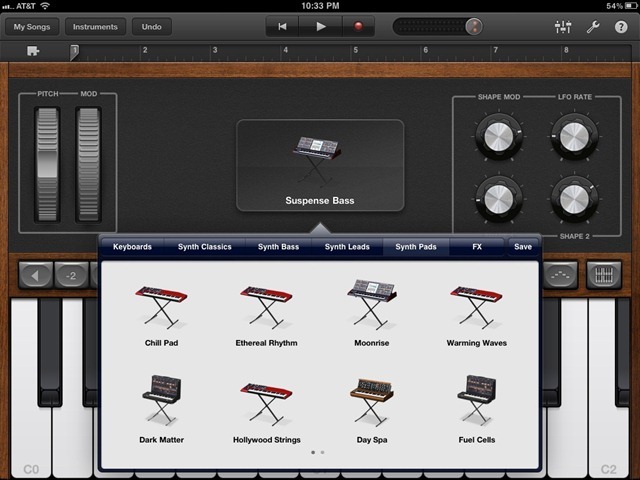 A big splash this week for the iPad: Apple released GarageBand. I'm not going to write a complete review for it, there are more then enough off them already. It could have so easily have been THE ultimate music app that would dwarf all other music apps on whatever mobile platform. On Android, for example, I can count the amount of decent music apps on 1 hand and STILL have several fingers left to pick my nose. 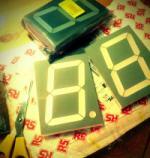 This is going to be a usability piece. If you give GarageBand on iPad to your kid or your mum, no doubt they will enjoy themselves silly whipping out great sounding tunes like it's nothing. It's great to toy around with and it's fun to use. So easy! And that's the key: "it's great to toy around with"
If you would give it to an (amateur) musician with the actual intention to create something unique, it would be a frustrating experience beyond repair. 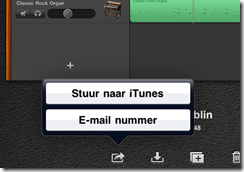 Before you start screaming that GarageBand iPad is not meant for the half serious musician, ask yourself why not! Clearly it has one of - if not THE - most powerful music engines on the iPad and it hosts some very advanced features. 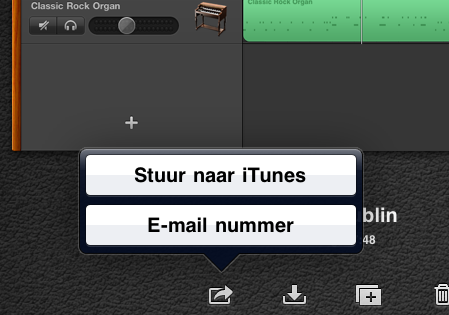 But at the same time it lacks some super obvious things that most other music apps DO have. I'm not talking about advanced stuff, but basic things like copy/paste, or the ability to do small edits after you recorded a track, or fades,... things that are plain necessary if you want to do more than toying around. For example: you've just played and recorded the best piece ever on the touchpiano. It gets recorded to midi, nicely visualized in the sequencer. There's one spot you played a note out of rhythm or out of key. Currently there's no way to fix that, other than re-record it. 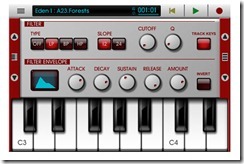 Would it harm the fun or usability in any way to add midi editing? Or the lack of copy paste: you can't copy one track to another project, or copy a sample to another app. This is an issue that is solved already a long time ago with the system wide pasteboard, first made popular by Intua and perfected by Sonoma. 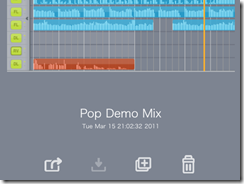 About all music apps support it, allowing you to copy paste your sounds between apps, creating your own perfect mix. All music apps ... except for GarageBand. Musicians create music with whatever they find. They build the best grooves with Rebirth, record the fattest guitars with Amplitube, fine-tune the ultimate synths with Nanostudio, and then combine it all with the best sequencer for the final mix. 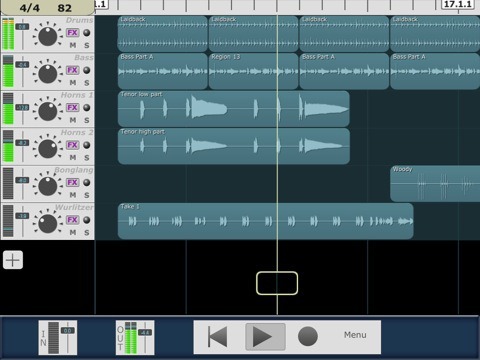 All this is already perfectly possible with the iPad, but not when you want to use GarageBand: there's no usable way to get your sound in or out GarageBand. 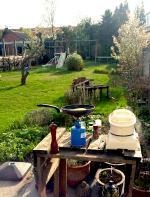 I want a mobile studio, independent of other hardware device. 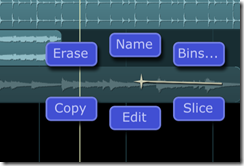 If you have a Mac lingering around, you wouldn't use the iPad to record, you would use the full GarageBand. Why didn't apple add those features? Because they would stand in the way of the user experience? Because they don't target the more demanding musicians? Maybe, but that would imply that they see GarageBand on the iPad as a toy themselves. Does this then mean they see the iPad as a toy? 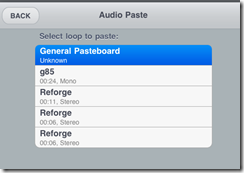 If you have a Mac lingering around, you wouldn't use the iPad to record, you would use the full GarageBand. And there you have it. It's my opinion that Apple deliberately created a crippled version of GarageBand to avoid cannibalizing their Mac products. This is the same reason the iPad is still forced to sync with bloody f*cking iTunes - with a cable none the less, how 20th century like. It would be a far better user experience to let the iPad sync wirelessly, or not force it to sync at all, but then people would start using the iPad INSTEAD of a laptop, not NEXT TO a laptop. Obviously, this would hurt the apple sales: they want to sell you 2 devices, not 1. Yes, Apple values the user experience very high, but not nearly as high as making money. Obviously, this means a huge opportunity for other developers that don't have these restrictions. The best example is the software for jailbroken iPads. It seems those "rogue" developers are the ones that are pushing the iPad forward the most and often Apple is copying the best gems of the jailbroken apps later on in their official software. Things like multitasking and folders are examples of this. An example of a super useful app for jailbroken devices that Apple yet has to copy is Retinapad, which enables the high res mode of iphone apps on your ipad. But back to the point: in the regular app store there are also some true gems of music apps that DO target the more demanding users. No, they are not that slick, but double as useful. 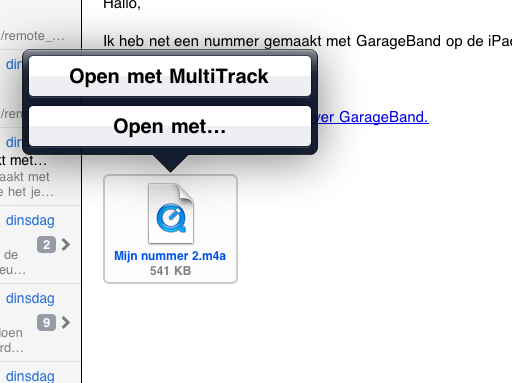 Luckily multitrack DAW can import samples from email attachments. 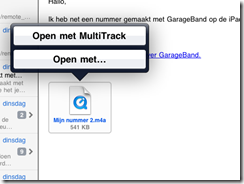 There you can copy it to the pasteboard. Open studio HD, and paste it in a track, then alter the speed. How's that for usability, eh? that was only 17 clicks, 3 apps and a roundtrip to the mailserver! 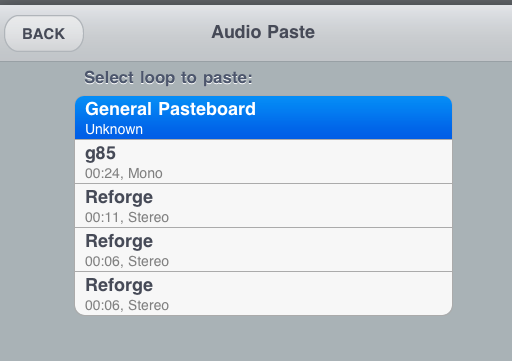 Come on Apple, audio copy/paste is everywhere, surely this should be added in the next update. 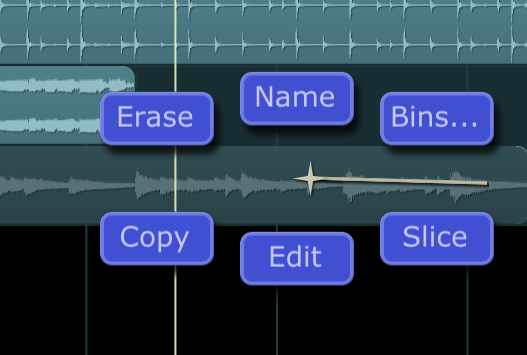 And speaking of Studio HD: I don't know who copied who, but come on: the 5 months old Studio HD on the left, the brand new GarageBand on the right. I kind of hope I'm missing something here... Maybe those are standard iPad design guidelines or something? 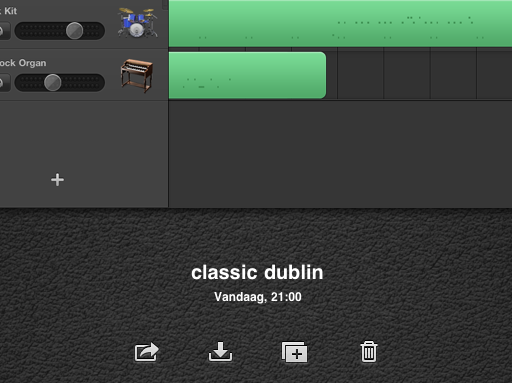 Not to be all talk and no action I created a very small tune with GarageBand. The tune was recorded and arranged in about 15 minutes. Very Easy and fast. The guitar is a cheap toy (acoustic!) guitar recorded with the internal mic. 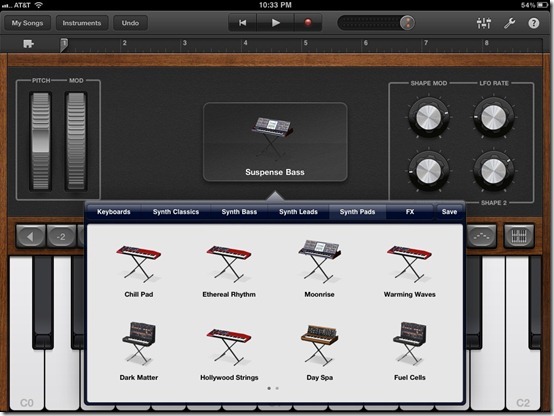 The drums and Bass are "smart instruments"
GarageBand for iPad is awesome, it really is, but it's a toy. There's nothing wrong with that, its genuine fun to use. 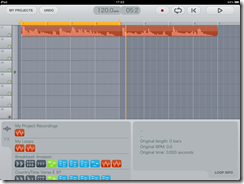 It's also great as a fast and easy multitrack recorder if you want to record and edit on the move. 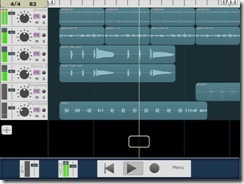 However, if you want to use your iPad as standalone recording studio, (like I do) there are far better options. Check out Multitrack DAW, Studio HD (which does time stretching!) 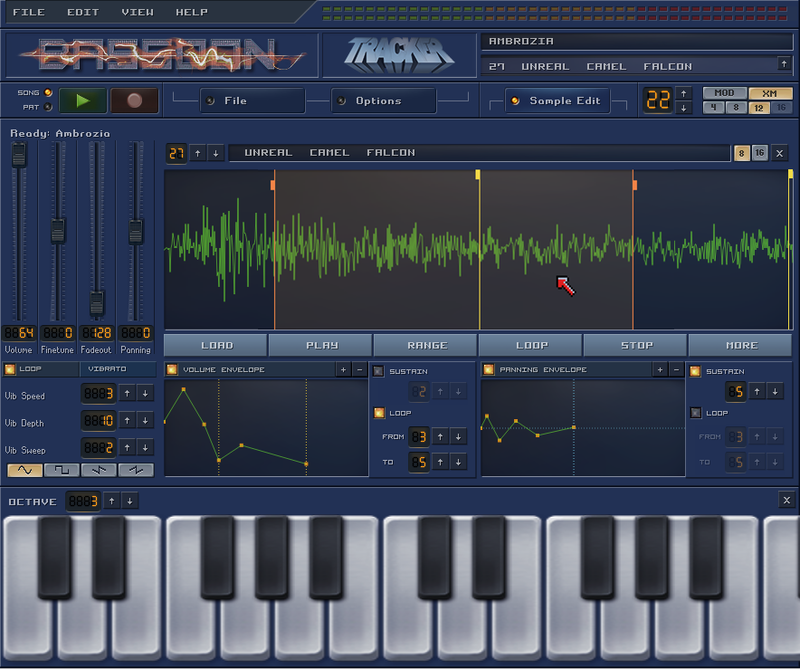 or Beatmaker 2. If you're a guitar player, Ampkit and Amplitube provide a much better sound, features and experience. As a software developer, I marvel at the beauty and technical excellence. As an amateur musician, I find it almost unusable. Let's hope I'm completely wrong about Apple's strategy with GarageBand and they'll address its shortcomings in a next update. Tinkering with digital audio, I love it! A few months ago I was exploring the use of the Ipad as digital recording device. A small tune came out of it. nothing too fancy, just a piece made from scraps i created as test with various audio apps. My plan was to draw a videoclip for it - also on the iPad. 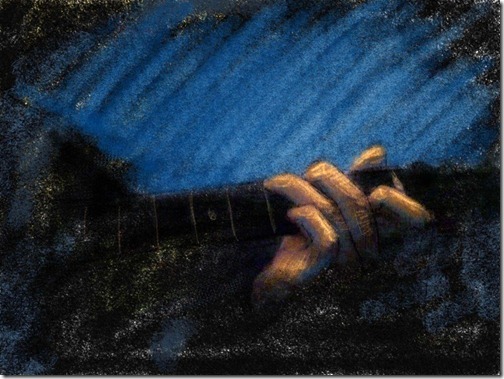 Yes: ... draw ... even at 1 frame a second, it meant lot's of work and grew tired of it. It's one of those things that end up on the "to do whenever I find some time for it" pile, which is dangerously close to the "never" pile. 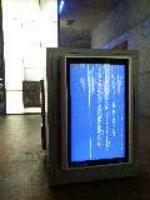 This image is one frame of it. We'll see about the videoclip part, but here's the audio track already. It's completely recorded on the iPad, only using iPad apps, the internal mic and a (real) acoustic guitar. Why? Because making music using toys is fun! 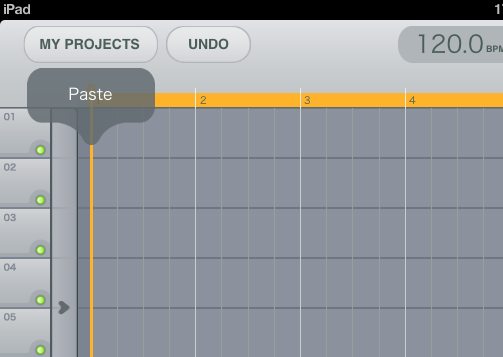 The drums are done with Beatmaker, which also functioned as copy/paste glue between apps. 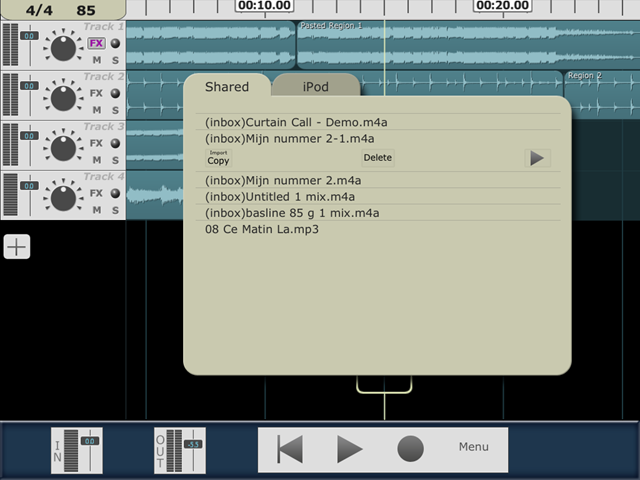 The recordings of voice, guitar, final sequencing and mixing was done with multitrack DAW. Conclusions: using the iPad as mobile music studio is fun. Some pretty good results can be achieved, considering the cheap guitar I used and the internal mic. 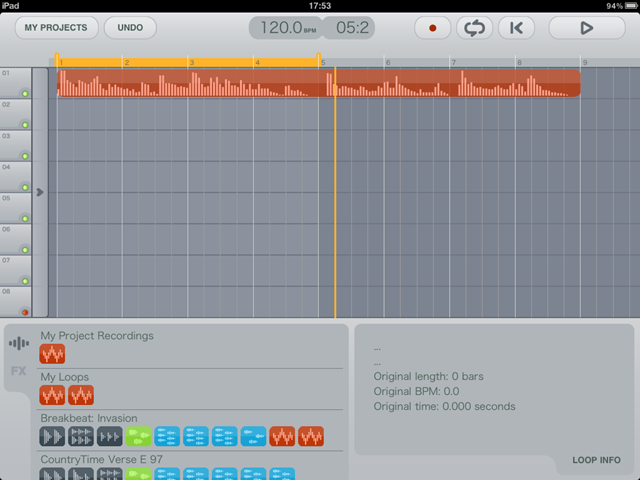 There are some pretty awesome apps out there which make the iPad a valid mobile recording studio. However, one has to jump through some really weird hoops if you want to combine multiple apps and get the most out of it. 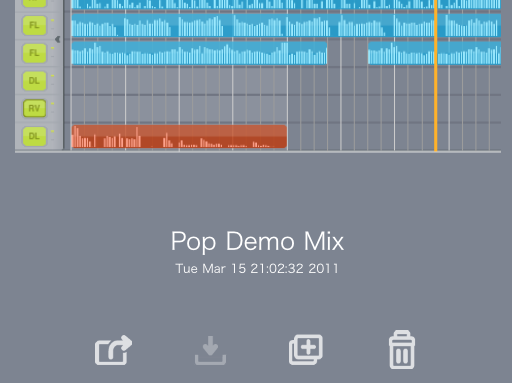 The lack of (access to) a file system makes it sometimes daunting to get the samples and tracks from one app to another. 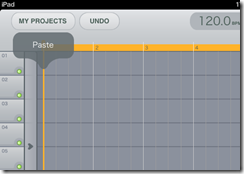 You end up spending as much time swapping apps and moving files around then to actually create some music. It's Apples vision to prefer usability over features. That's great, but sometimes they end up in the paradox that their quest for usability actually makes the product less useful. As Einstein reportedly used to say: "Everything should be made as simple as possible, but not simpler." , right? My little project of last week was to produce a CD for the school of my kids. This year's theme was "music" so a CD of all the children songs seemed a nice present for all the proud parents. We collected all the recordings people had made during the year and made a few new ones. I love fiddling with knobs and music software so I volunteered to "spice up" the vocal recordings, adding various instrument tracks and brushing up the vocals. I mostly used Adobe Audition for audio restoration and Ableton Live for the editing, arrangements, mixing and effects. Ableton Live really is an amazing piece of software: a perfect example of fitting a gazillion options in a clean and intuitive interface, very fun to work with. It was too bad that some of the base recordings were really crappy, taken out of cell phone video recordings and such, but oh well... there was no way to redo those recording so I had to work with what I had. If someone has some good tips how to improve those lo-fi cell phone audio recordings, please let me know as I have no clue how to do that. Obviously it's not possible to create oranges out of orange juice so maybe those recordings are just "lost", but still, maybe someone knows how to make them sound less sharp and narrow.